Just so you know where my head is right now, I’m in my Tuesday Office meeting with Erwin McManus and Jesus. OK, Erwin is not actually, physically here. I am so excited about my devotional and study time. The other day I was in the bookstore picking out a couple of things to read. I felt really drawn to a specific author, Erwin McManus, who is the Lead Pastor of Mosaic. Something in me got excited like me and Jesus were about to embark on a great journey. So I am stoked. Go pick up a copy of one of Erwin’s books. It will bless you or maybe I’m just on my own little trip. 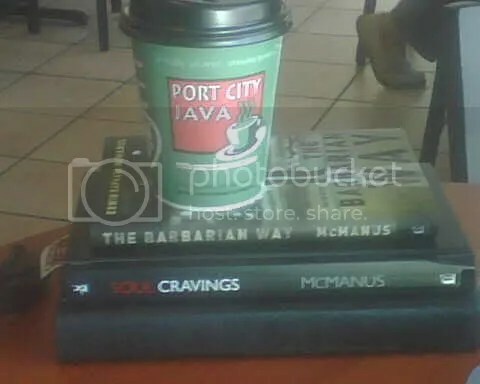 This entry was posted in Books, Leadership and tagged Books, christianity, devotion, Erwin McManus, God, Jesus, journey, Leadership, Mosaic, religion, spirituality, The Dwelling Place, trip, Tuesday Office. Bookmark the permalink.